' The Shine Project - Sisters, What! 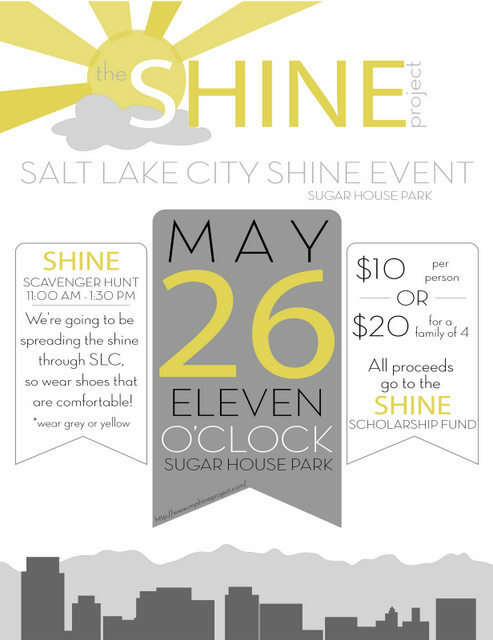 So this summer I have the great opportunity to be a project leader for an event here in Salt Lake City for the non-profit called "The Shine Project". The Shine Project's purpose is to "inspire you to live the highest quality of life obtainable, and to motivate you to join our efforts in making this world a better place".The event that I am helping with is to help raise money to go into the scholarship fund which helps at-risk teens go to college. It is a small non-profit with a big heart and great idea. Anyway if you are in the Salt Lake area we would love to see you guys there. To learn more about this non-profit and the event go here. Sounds like a really cool event! Awesome that you are part of it!